Do you have projects floating around in your head? Some that just float and you dismiss, and others that you just can't seem to shake? I do. Projects that you just can't help but start pulling fabrics out for, even though you have more unfinished projects on the go than you can handle? That's what is happening here. It happens all too frequently I am afraid. I really would like to make a quilt with fabrics that are designed by vastly different designers. I have gathered together some Amy Butler, Kaffe Fassett, and Valori Wells, but also some classic stripes, toile, Echino double gauze by Etsuko Furuya, and Mrs March 1930's collection. 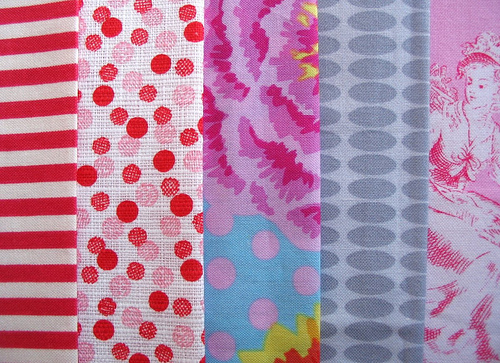 Some of these fabrics are way out of my comfort zone, and I am not even sure if they will all work well together. I am surely going to give it my best shot, but not until the binding is on those baby quilts! Maintain focus! Oh yes indeed I do too! I toss and turn some nights and loose so much sleep I am tempted to get up and go to the stash and start piling up fabrics straightaway! My doctor tried to tell me it was menopause but I think she's not a quilter! i have tons in my head....tryin to maintain focus is so hard. i have craft ADD. I love your choice in those fabrics & I think they will look fabulous together...I am also going through my scraps to use with white to make a quilt for a friends new house...I Love the Sq's....Thanks so Much for showing me a New Direction...I Love it.!! No be naughty and start another project cause that gives us an excuse to do the same! Oh, all the time! I'm actually a little afraid to take stock of all my UFOs, WIPs, designs, and ideas. I think it would scare me. Good luck mixing the fabrics. I don't know any other way. Definitely always have great plans in my head - just a pity they don't always translate so well into action! I always manage to start with a hiss and roar which fizzles into a snap and a pop. But your blog is motivating me to get things done! Can't wait to see this new beauty - I especially love the pile in your second photo!!! It's hard to focus on WIPs when all those uncut fabrics keep calling your name. I couldn't resist a new project from my head today and actually completed it!! Woo hoo!! Your new project will, as always, be a stunner!! This happens way too often to me too!! So many ideas going on in my head, but not enough hours to do them all! I am liking this vision! In my head...in my head (song from the Cranberries now stuck in my head). Yes, I tend to get excited about new combos of fabrics and start making "creative" messes. Looking forward to your newest project. Too many in my head. Can't sleep for putting another one together. Gotta FINISH something! Oh gosh, yes! I ALWAYS have projects in my head - sometimes I even dream about them. It's why I always have notebooks around to write down those ideas. Since I have a full time job (and kids and a spouse and all the responsibilities of a wife and mother and I LIKE spending one on one time with my spouse) I have to really carve time out of my life to quilt. When I'm retired, I supposed, I'll get to allllllll of those ideas! Looking forward to seeing what you're up to! 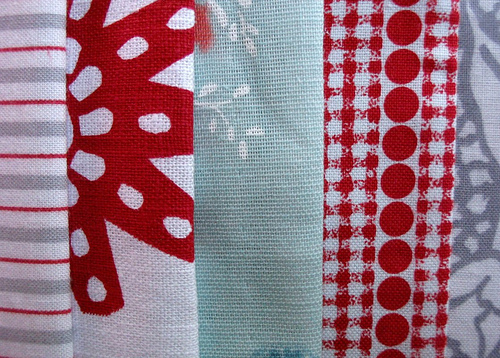 Can I just say that the second option (red, grey and aqua) makes me want to go pull out new fabrics from my stash??! Lovely! I always have projects in my head, too. Sometimes so many, that I lose them before I get to them because new ideas just keep popping in. 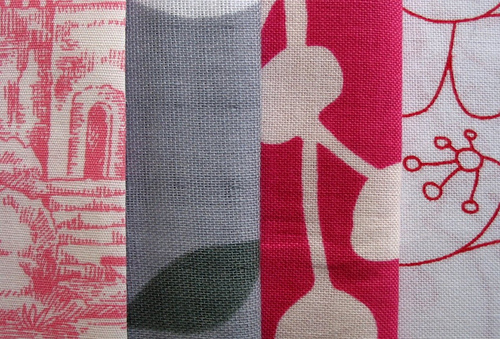 I love combining fabrics from different lines/designers. I think it makes things much more interesting and often gives a quilt a lot more sparkle. I see so many quilts made entirely from one line with nothing added that -- even though the fabrics and colors are beautiful -- just look kind of flat. I am cracking up right now. I just a few seconds ago, got out my little notebook, because I had a flood of ideas go rushing through my itty bitty brain! And I know if I don't write them down, I'll loose them. And I want to try every idea today! And I have so many other projects waiting for me. ;o) I Love the sneak peaks you have given. They look fabulous! This totally happens to me on a daily basis...sometimes I can't even sleep from it at night...my mom said it best one day..."somedays I wish I was stupid and didn't know how to do anything creative then my brain won't hurt so much with all these ideas floating around in it..."
can you tell me what the fabric is in the last photo, second from the right? is that an amy butler? I always have too many ideas for my own good. Except I am pulling out stones and chain because I make jewellery. Those fabric combo's look lovely and I look forward to seeing what you do with them. I totally know what you mean, I have lots of projects pulled already. I don't think I'll ever be caught up in my lifetime.